Last Sunday was the first time that I've overclocked in years. No hwbot submission. Just me, a 1090t cpu and some some water. Bench session lasted a good 12 hours off and on. Now that my weekends are free and no longer have to go to sea I've rediscovered the passion for pushing hardware to its limits. Looking at pictures on threads from 2010 and 2011 brought back some great memories. Dom and his pawnage, splave and his beastliness, Hondacity and his willingness to teach me memory tweaking for hours on end over instant messenger, Kikicoco going thru puberty, and many others that supported me and answered my noob questions as I was getting started. And of course Kal's introduction to the frost. My first visit to Kal's home he pulled out a pot with a probe and let me pour LN2 in it. When I saw -190 deg I was hooked. The rest is history. Things are different now. 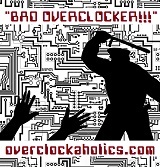 New hardware, new rules and different perspectives on overclocking in general. Members have come and gone but one thing here has not changed. OCA has and will remain a sanctuary for some of the best people in the overclocking community. LMAO! just wanted to see if you were paying attention. All times are GMT -10. The time now is 10:03 PM.